New Chloe March EP, Remixes & Video! 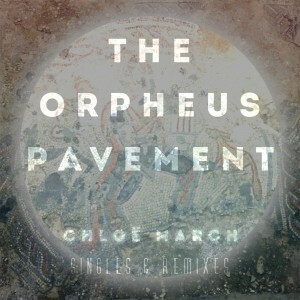 Hidden Shoal is excited to present the release of The Orpheus Pavement, the new six-track EP by English artist Chloë March, featuring new song ‘The Orpheus Pavement’, along with two originals from her acclaimed album Nights Bright Days and three remixes (by Lvmark, Sam Atkin, and Chloë March). The Orpheus Pavement is dreamy, slow-motion pop music, pulsating with sensuality. Listening to the EP feels like surreptitiously ingesting laudanum and wandering half-dazed through a secret garden that’s slowly shifting and warping around you. As with so much of Chloë March’s work, it was inspired by the mythical – the largest Roman mosaic ever found in Britain, which depicts Orpheus charming nymphs, tigers and other creatures with his songs. In this instance, the story is just the start, as March’s compositions bloom from reverberating piano and voice into evocative soundworlds that contain multitudes. Two of the songs are further transformed by remixers Lvmark, Sam Atkin, and March herself, into shimmering refractions of their former selves. Oft compared to singular artists such as Nina Simone, Beth Gibbons and Elizabeth Fraser, Chloë March follows her own independent path, writing, engineering and producing from her home studio in south-east England. Inhabiting musical territory somewhere between art song and folk, dream-pop and electronica, the ambient and the cinematic, March embraces all these influences to create poetic, emotionally charged and intensely atmospheric songs and soundworlds. Lvmark is an electronic music producer hailing from Northern Sweden, drawing influence from the isolation and vastness of his homeland to create echoing electronica. Sam Atkin is a Fremantle-based ambient and experimental producer operating out of his shed-bedroom, who released his debut album Gently, Quietly in 2015 through Workplace Safety CDRs, and has been keeping it slow and sad ever since. The Orpheus Pavement is available now via BandCamp and the usual digital stores. You can also check out the title track and the two remixes by Lvmark and Sam Atkin at the Hidden Shoal SoundCloud. Chloe has also produced a beautiful music video for ‘The Orpheus Pavement’ which you can check out over at YouTube.